Cascone, A., & Cascone, G. (2011). Grave secrets. New York, NY: Starscape. From the Nickelodeon producers of Are You Afraid of the Dark?, Annette and Gina Cascone bring Deadtime Stories series with each book in the series independent of the others with a new cast and storyline, and all are very reminiscent of the Goosebumps book series. These are great books for those who love suspense, being scared silly, and a good giggle here and there. In Grave Secrets, while Amanda Paterson is playing with her friends; Laura, Kevin, and Jarred in her backyard, they find a dead squirrel. 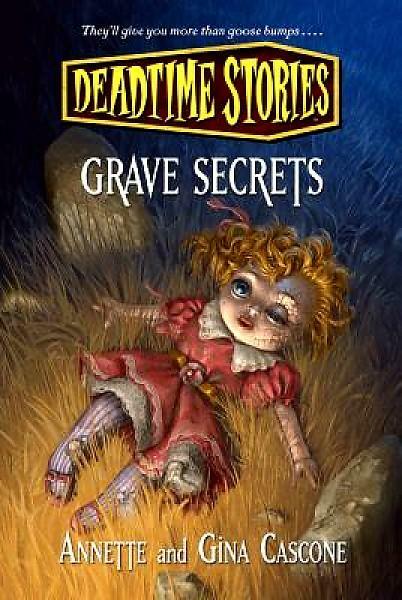 While burying the squirrel near all her departed family pets, they discover a creepy doll that was buried by the scary old neighbor lady Mrs. Barns that has many more secrets than just that one broken doll. The old lady, nicknamed Barnsey by the local kids has been rumored to be a witch, often seen in her yard late at night, and some say they have even heard eerie screams from her own home. After finding the doll, taking it in her house, and cleaning it up, Amanda wasn’t imagining when she heard a voice say “I want my baby back!”. Amanda initially wasn’t sure if it was a ghost or a curse by Mrs. Barnsey. Yet, after the doll surprisingly speaks to Amanda and tells her that it needs to be reunited with Anna, a childhood friend of Mrs. Barns (aka Emily), Amanda and her closest friends set out to solve the mystery of Anna, the doll, and Mrs. Barns. Without gore or violence, Grave Secrets manages to spook its readers with each cliffhanging chapter ending in this modern and age appropriate horror story. The story has a safe and surprising ending; Mrs. Barns isn’t a witch, but rather an old lonely lady with a troubled past. Suspense and humor is ingeniously blended so as to keep any reader easily hooked and eager to know what will happen next. Grave Secrets’ ending leaves the reader wondering if the fright over, or is there still more to come? Deadtime Stories are all older stories re-written and created for a new generation of tween readers and also a new TV series on Nickelodeon. And for a bonus, Grave Secrets even offers an exciting sneak peek of the first chapter of The Witching Game.